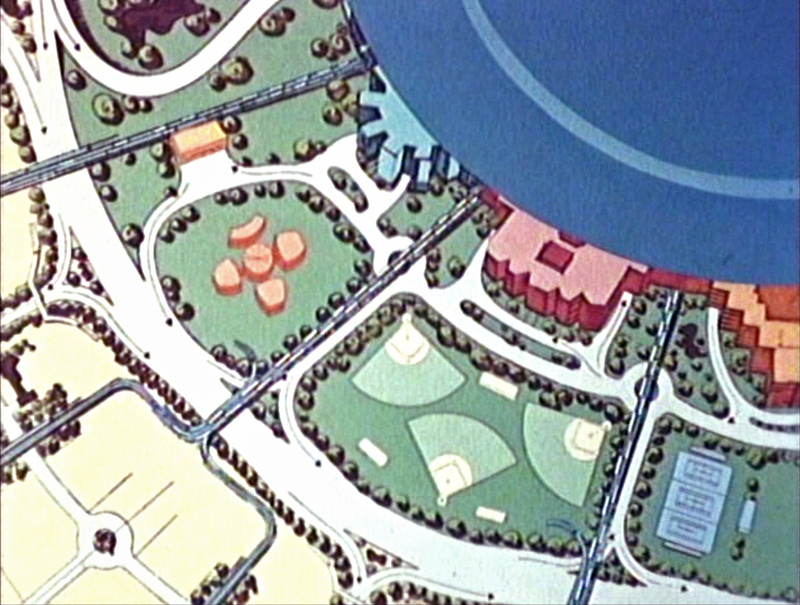 As Epcot gets ready to celebrate it's 35th Anniversary, let's look back to when we were first introduced to the city of EPCOT. 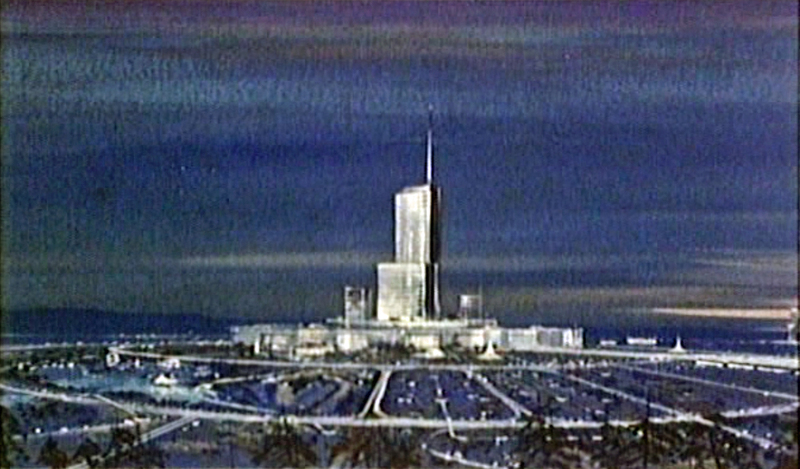 In October 1966, Walt Disney Productions prepared a film (with different endings for different audiences) to introduce citizens of Florida and potential business partners to the Disney World resort and the futuristic city it would include. 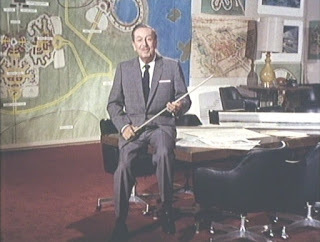 The film features Walt Disney, appearing just two months before his death, sharing plans from a mock-up of the room where he and his Imagineers were planning the "Florida Project." Below is the transcript from that film. This was all a Disney dream a dozen years ago, a far-off project that was totally unproved. Today, 60 million people have come here, from every state in America and from almost every nation around the world. In Town Square on Main Street, manu have paused to read the dedication plaque that symbolizes the warm and friendly spirit of Walt Disney’s magic kingdom. Here, age relives fond memories of the past, and here youth may savor the challenge and promise of the future. Disneyland is dedicated to the ideal, the dreams, and the hard facts that have created America, with the hope that it will be a source of joy and inspiration to all the world. Disneyland grew out of Walt Disney’s own feeling that an amusement park should offer more to the entire family. Here was no mere amusement park. Here was a whole new concept in entertainment, where parents and children could have fun together. The touchstone of Disneyland’s success has been its concern for people, a wholehearted dedication to the happiness of the people who visit here. Today, Disneyland has established standards of performance unsurpassed in all of the world. Yet, in the planning and building there were no standards to follow. Whatever worked became the code. Whatever failed to meet the public need was changed, replaced by a better idea. People and vehicles are constantly in motion at Disneyland. Here, people travel aboard almost every method of transportation man has ever designed. 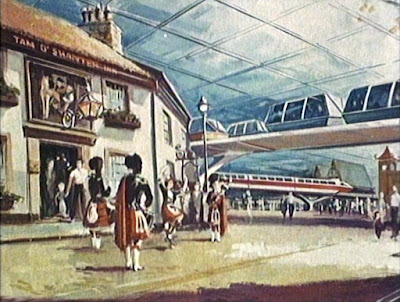 Provocative, new ideas, like the first monorail system in the western hemisphere, have demonstrated their potential in this practical proving ground. Disneyland vehicles have carried 340 million passengers in comfort and speed, and have traveled more than 19 million miles in unequalled safety. 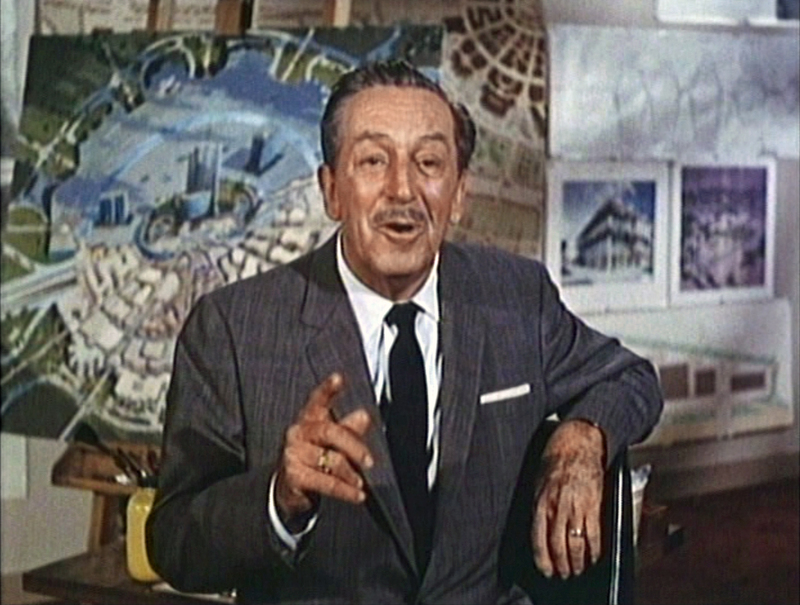 To plan Disneyland, Walt Disney long ago established a design organization called WED Enterprises. Today, the staff at WED includes designers, architects, and engineers skilled in the Disney way, and also fine craftsmen and technicians skilled in the arts of the space age. 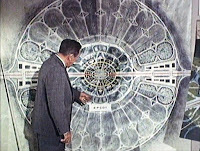 What WED does is called Imagineering, a blending of creative imagination with technical know-how. The talents of WED have gone to work outside Disneyland, too. 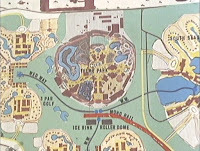 At the New York World’s Fair, for of the most popular attractions were Disney shows and corporate exhibits that skillfully welcoming and entertained more than 150,000 people every day. Yesterday, Disneyland, and the New York World’s Fair. 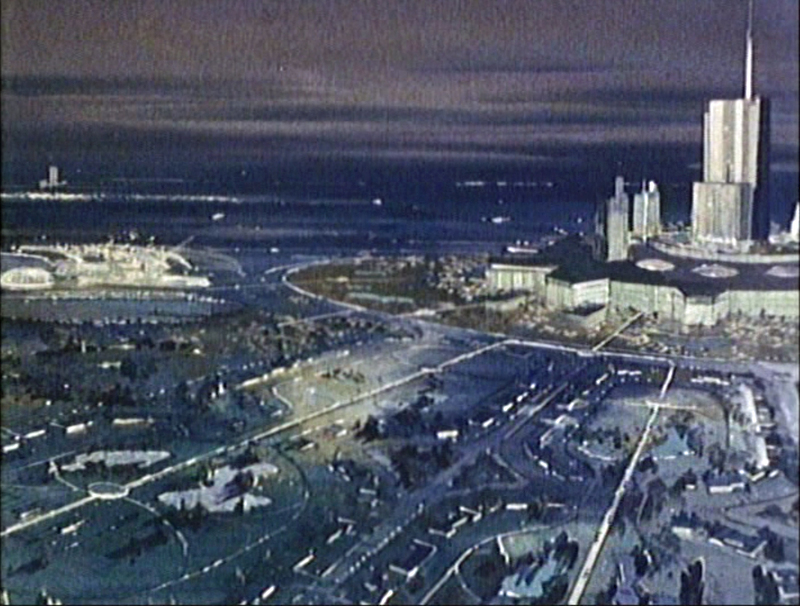 Tomorrow, a project so vast it has already been called a whole new Disney world. And now, here is Walt Disney. Welcome to a little bit of Florida, here in California. 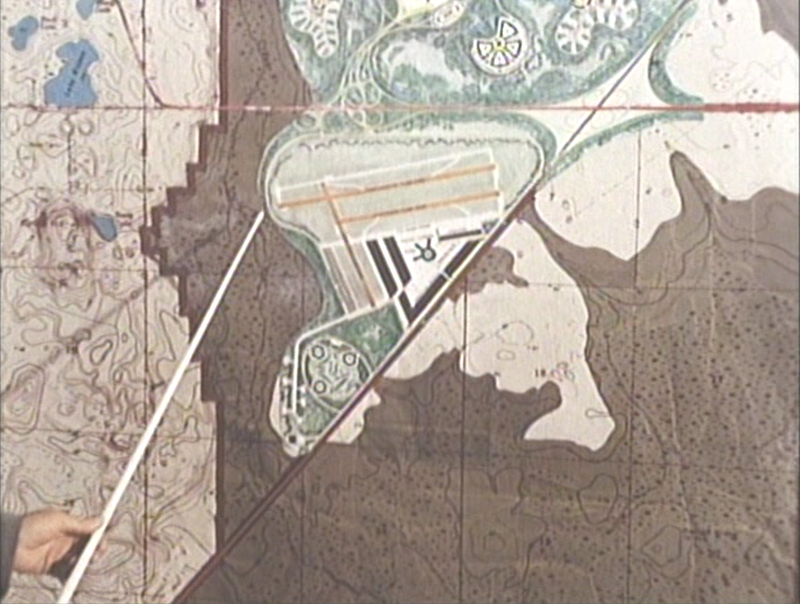 This is where the early planning is taking place for our so-called Disney World project. 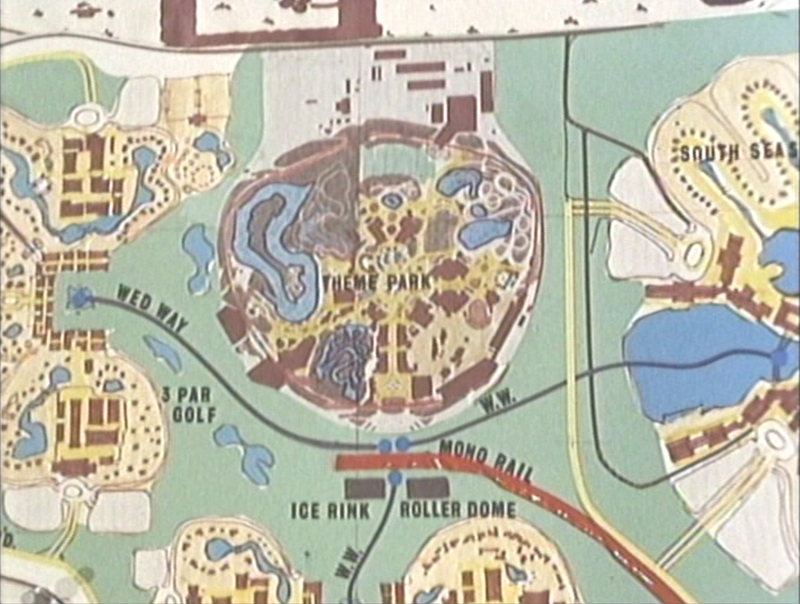 Now, the purpose of this film is to bring you up to date about some of the plans for Disney World, but before I go into any of the details I wanna say just a word about the site of our Florida Project. 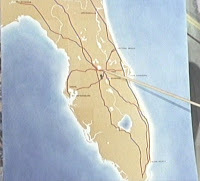 As you can see on this map, we have a perfect location in Florida, almost in the very center of the state. In fact, we selected this site, because it’s so easy for tourists and Florida residents to get here by automobile. 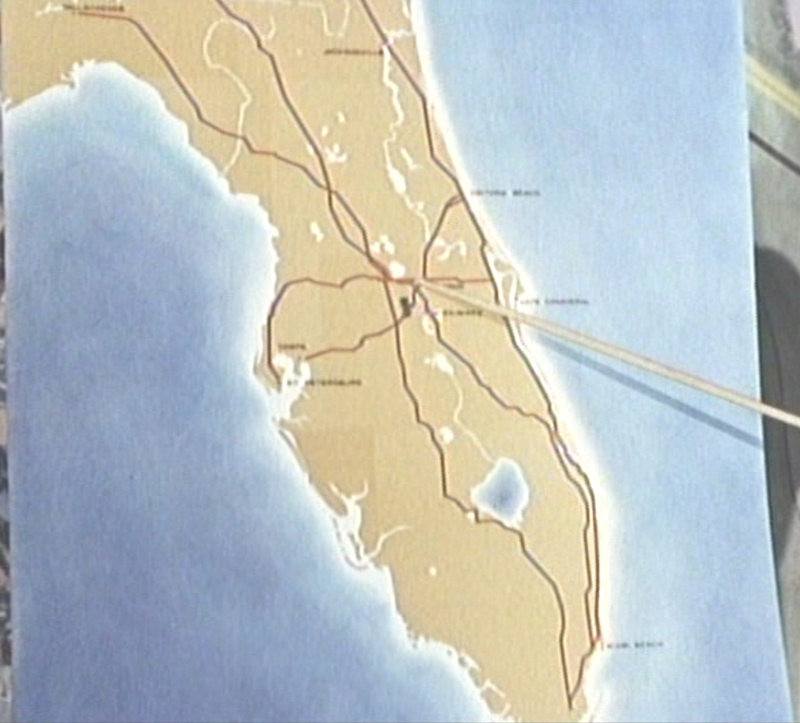 Now, in larger scale on this map, our Florida land is located partly in Orange County and Osceola County, between the cities of Orlando and Kissimmee, and the important thing is that the Disney World is located just a few miles from the crossing point of Interstate 4 and Sunshine State Parkway, Florida’s major highways, carrying motorists east and west and north and south to the center of the state. The sketches and plans you will see today are simply a starting point, our first overall thinking about Disney World. Everything in this room may change time and time again as we move ahead, but the basic philosophy of what we’re planning for Disney World is going to remain very much as it is right now. We know what our goals are. We know what we hope to accomplish, and believe me it’s the most exciting and challenging assignment we’ve ever tackled at Walt Disney Productions. Today, I want to share with you some of our ideas for Disney World. 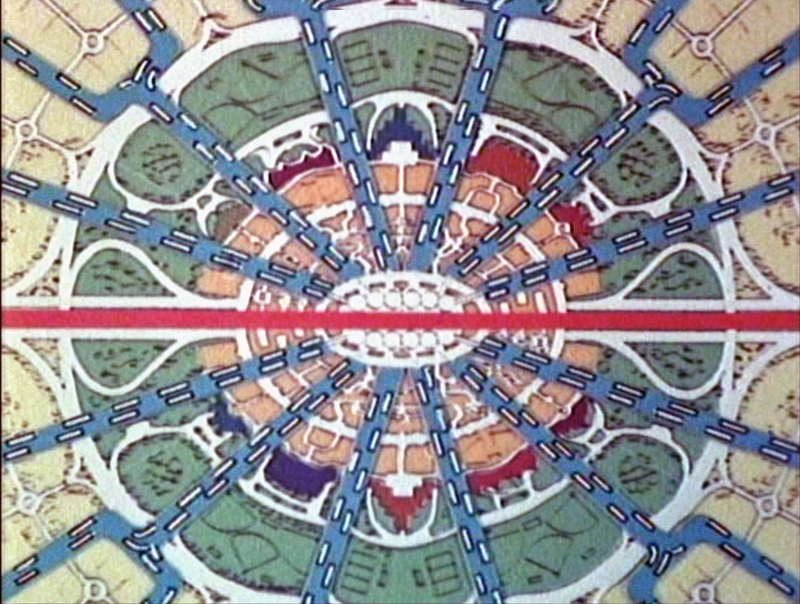 Now, the prologue to this film told you some of the philosophy that made Disneyland in California what it is today. Of course, there will be another amusement theme park in Florida, similar to the one in California. We are now developing a master plan that ecompasses the theme park and all the facilities around it that will serve the tourists, hotels, motels, and a variety of recreation activities. In fact, just this little area alone if five times the size of Disneyland in California. 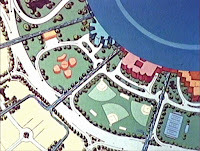 But, as you can see on this master plan, the theme park and all the other tourist facilities fill just one small area of our enormous Florida Project. According to this scale, I am six miles tall. Now, that’s twelve miles from here up to here and the whole area emcompasses 27,400 acres, that is 43 square miles, twice the size of the island of Manhattan. Now, the area we propose to develop is between the Reedy Creek Swamp and the Bonnet Creek Swamp. Here in Florida, we have something special we never enjoyed at Disneyland, the blessing of size. There’s enough land here to hold all of the ideas and plans we could possibly imagine. Right now, our plans include an airport of the, future down here in Osceola County, an entrance complex where all visitors will enter Disney World, an industrial park area covering about 1,000 acres, and, of course, the theme park area, way up here. And all these varied activities around the Disney World will be tied together by a high speed rapid transit system running almost the full length of the property. 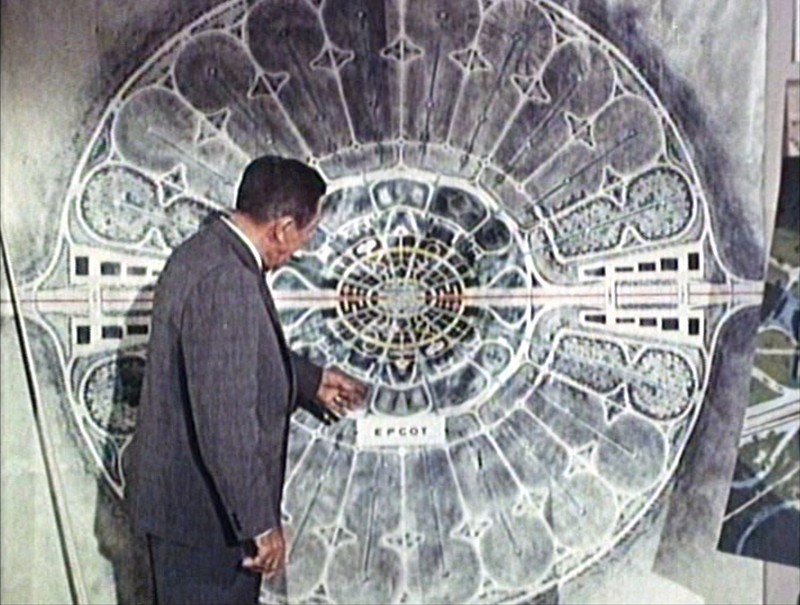 But, the most exciting and, by far, the most important part of our Florida Project, in fact, the heart of everything we’ll be doing in Disney World, will be our Experimental Prototype City of Tomorrow. We call it EPCOT., spelled E-P-C-O-T, Experiment, Prototype, Community, Of, Tomorrow. Here it is, in larger scale. EPCOT will take its cue from the new ideas and new technologies that are now emerging from the creative centers of American industry. It will be a community of tomorrow that will never be completed, but will always be introducing, and testing, and demonstrating new materials and new systems. 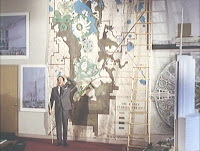 And, Epcot will always be a showcase to the world for the ingenuity and imagination of American free enterprise. I don’t believe that there’s a challenge anywhere in the world that’s more important to people everywhere than finding solutions to the problems of our cities, but where do we begin? How do we start answering this great challenge? Well, we’re convinced we must start with the public need. 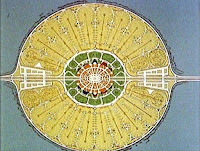 And, the need is not just for curing the old ills of old cities. We think the need is for starting from scratch on virgin land, and building a special kind of new community. 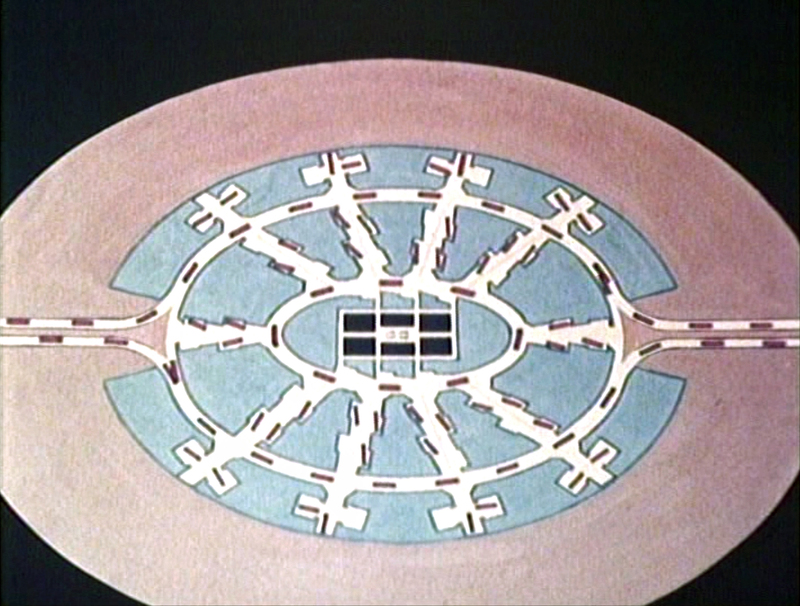 So, that’s what Epcot is, an experimental prototype community that will always be in a state of becoming. It will never cease to be a living blueprint of the future, where people actually live a life they can’t find anywhere else in the world. Everything in EPCOT will be dedicated to the happiness of the people who will live, work, and play here, and those who come here from all around the world to visit our living showcase. We don’t presume to know all the answers. In fact, we’re counting on the cooperation of American industry to provide their very best thinking during the planning and the creation of our Experimental Prototype Community of Tomorrow. 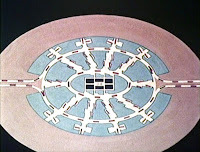 And, most important of all, when EPCOT has become a reality and we find the need for technologies that don’t even exist today, it’s our hope that EPCOT will stimulate American industry to develop new solutions that will meet the needs of people expressed right here in this experimental community. Well, that’s our basic philosophy for EPCOT. By now, I’m sure you’re wondering how people will actually live, and work, and move around in our community of tomorrow. So, in the next few minutes we’ll go into detail about some of our preliminary sketches and layouts. Remember, though, as I said earlier, this is just the beginning, and with that thought in mind, let’s have a look. EPCOT will be a planned environment, demonstrating to the world what American communities can accomplish, through proper control of planning and design. Picture a wheel. Like the spokes of the wheel, the city fans out along a series of radials from a bustling hub at the center of EPCOT. 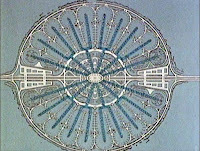 A network of transportation systems radiate from the central hub, carrying people to and from the heart of the city. 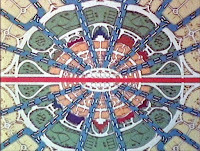 These transportation systems circulate to and through four primary spheres of activity surrounding the central core. First, the area of business and commerce. Next, the high-density apartment housing. Then, the broad greenbelt and recreation lands. 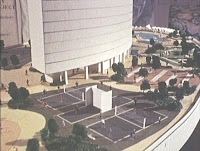 EPCOT’s dynamic urban center will offer the excitement and variety of activities found only in metropolitan cities - cultural, social, business, and entertainment. Among its major features will be a cosmopolitan hotel and convention center, towering 30 or more stories, shopping areas, where stores and whole streets recreate the character and adventure of places round the world, theaters for dramatic and musical production, restaurants and a variety of nightlife attractions, and a wide range of office buildings, some containing services required by EPCOT’s residents, but most of them designed especially to suit the local needs of major corporations. But, most important, this entire 50 acres of city streets and buildings will be completely enclosed. In this climate controlled environment shoppers and theater go-ers and people just out for a stroll will enjoy ideal weather conditions, protected day and night from rain, heat, and cold, and humidity. Here, the pedestrian will be king, free to walk and browse without fear of motorized vehicles. Only electric powered vehicles will travel above the streets of EPCOT’s central city. This towering hotel is the visual center of EPCOT, the shining jewel at the center of the city. It will offer tourists and vacationers not only the most modern guestrooms and convention facilities, but also a seven-acre recreation deck, located high above the pedestrian and shopping areas of the city. 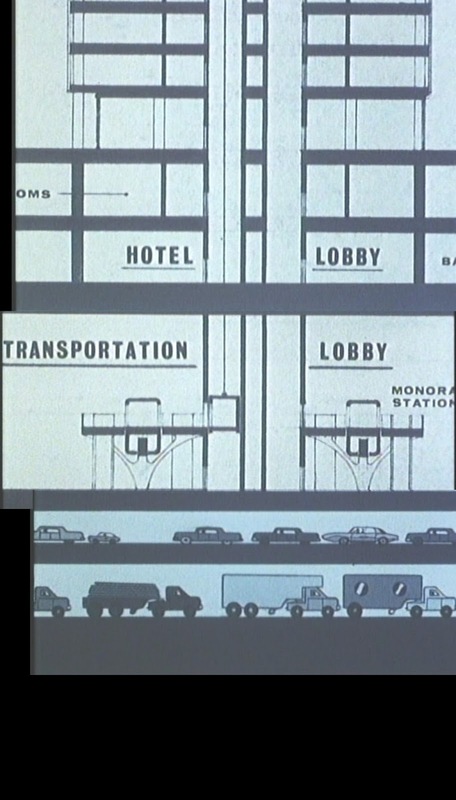 But, hidden from view, directly beneath the hotel is another kind of vital center, EPCOT’s Transportation Lobby. Although, out of sight to hotel guests, this transportation terminal will play a key role in the city of tomorrow’s ability to meet the needs of both visitor and resident. 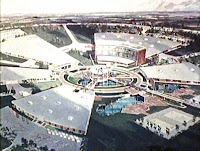 Two separate, but interconnecting transit systems will move people into and out of EPCOT in speed, safety, and comfort through this central terminal. Both are electrically powered - the high speed monorail, for rapid transit over longer distances, and a concept new to the American city for shorter travel distances, the WEDWAY PeopleMover. Automobiles and trucks will not be barred from EPCOT. In fact, a vast armada of vehicles will continually move through the heart of the community, traveling below the pedestrian level on roadways reserved for specific types of vehicles. Let’s look at another view of EPCOT’s transportation hub, and see how traffic flows the heart of the city on three separate levels. At the bottom of the stack is the truck route, reserved for supply vehicles. Trucks will have easy access to all loading docks and service elevators, for the delivery of commercial goods. The middle level is the automobile thruway, exclusively for cars. Adjacent to the roadway are parking areas, for the convenience of hotel guests. For the motorist just driving through, no stoplight will ever slow the constant flow of traffic through the center of EPCOT. 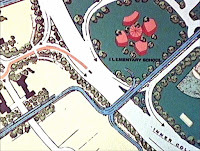 But, automobiles and freeways will not be EPCOT’s major way of entering and leaving the city. The transportation heartbeat of EPCOT will be the two electric powered systems, monorail and WEDWAY, that radiate to and from the transportation lobby. And, the key system in this coordinated network will be the WEDWAY PeopleMover. The first PeopleMover installation is already in daily operation at Disneyland. On peak days it carries nearly 40,000 passengers. The cars you see here are approximately ⅝ scale, considerably smaller than full-sized passenger cars would be for city use. EPCOT’s PeopleMover is a silent all-electric system that never stops running. These cars continue to move, even while passengers are disembarking or stepping aboard. Power is supplied from a series of motors embedded in the track, completely independent of the cars. No single car can ever break down and cause a rush hour traffic jam in EPCOT. Because the cars run continuously, there will be no waiting in stations for a WEDWAY PeopleMover. The next car is always ready. 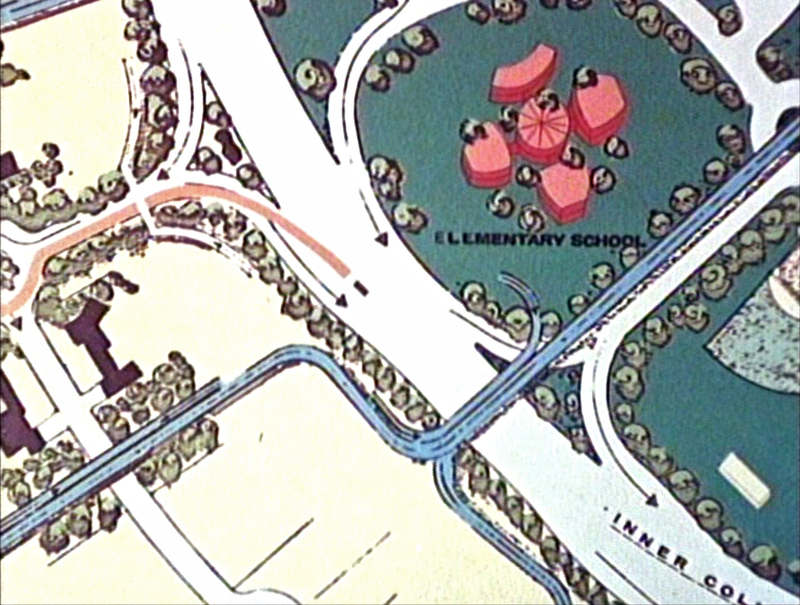 Now, let’s go back to the Transportation Lobby and see how the WEDWAY will travel along one radial between the center of EPCOT and a typical residential area. Leaving the Transportation Lobby, the WEDWAY trains travel above the downtown streets. Within minutes, the WEDWAY passes through the first station. Many people who work in the offices and stores of EPCOT’s city center board the WEDWAY here for their trip home. Some people leave the WEDWAY here, too. They live in EPCOT’s high-density apartments, surrounding the metropolitan center. Most passengers who ride the WEDWAY live beyond the apartments and stay aboard the PeopleMover as it crosses EPCOT’s sheltering greenbelt. EPCOT’s greenbelt is more than just a broad expanse of beautiful lawns and walks and trees. Here, too, are the community’s varied recreational facilities, its playgrounds for children, its churches, and its schools. Beyond the greenbelt are EPCOT’s neighborhood areas, of single-family homes. 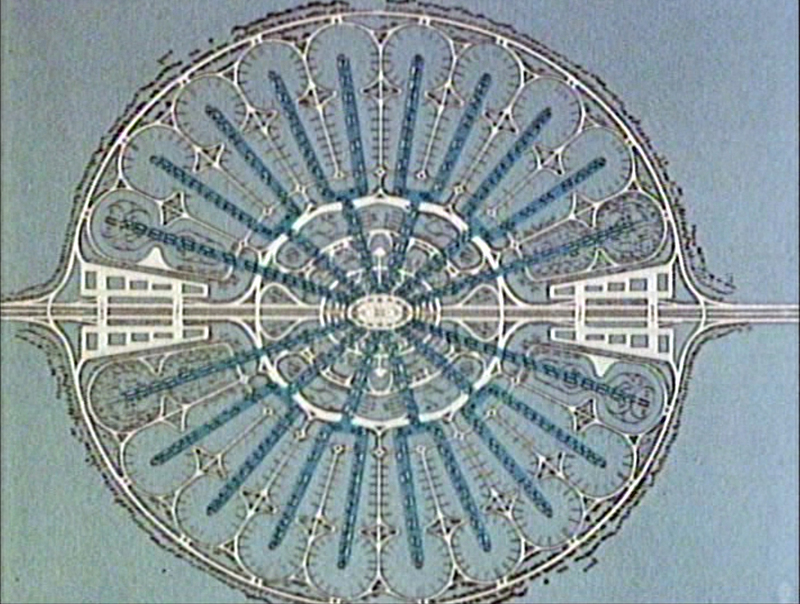 This is one radial neighborhood. Here, and throughout the community, residents returning from work or shopping will disembark from the WEDWAY at stations located conveniently just a few steps from where they live. The homes are located in a wide green area that provides light recreation activities for adults and play areas for children. Circulating through this area are footpaths, reserved for pedestrians, electric carts, and bicycles. Children, going to and from schools and playgrounds, will use these paths, always completely safe and separated from the automobile. The resident leaving home in his automobile will drive down a street reserved for motor vehicles. He then enters a one-way road the circles the city center. This road carries the motorist onto the main throughway, connecting EPCOT with other points in Disney World and with Florida’s nearby network of major highways. But, most EPCOT residents will drive their automobiles only on weekend pleasure trips. From all over the community, residents going to their jobs converge by WEDWAY on the center city. Many work downtown, in offices, stores, and shops, but most employees go beyond the city core to their jobs. From the Transportation Lobby, monorail trains carry employees either to the theme park or to EPCOT’s 1,000 acre industrial park. 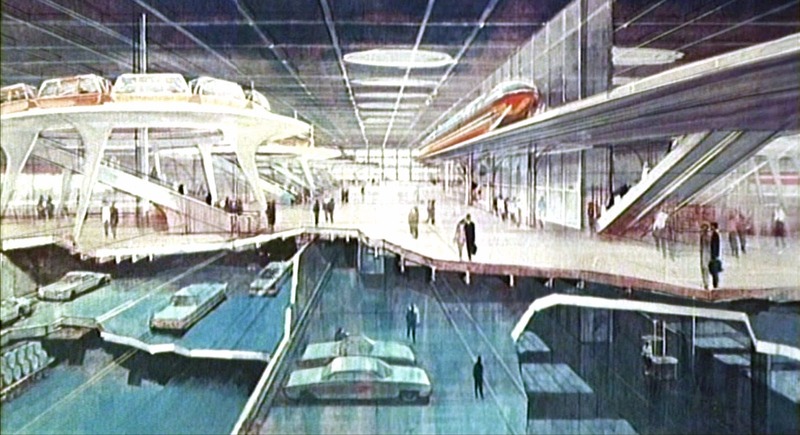 At this central station in the industrial complex, passengers disembark from the monorail and again board WEDWAY cars that radiate to each facility. This industrial complex will provide employment for many people, who live in EPCOT, but it will mean much more, not only for this community, but also for American industry. Here, the Disney staff will work with individual companies to create a showcase of industry at work. 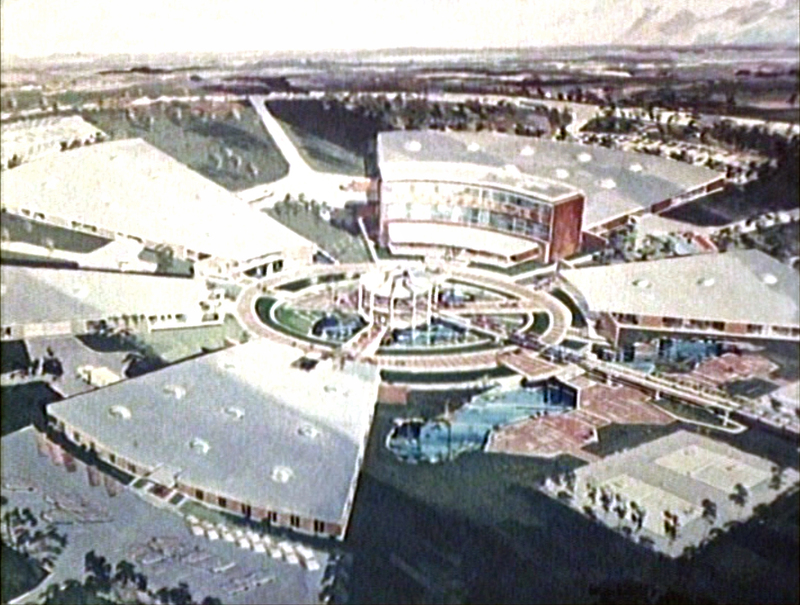 In attractive parklike settings, the six million people who visit Disney World each year will look behind the scenes at experimental prototype plants, research and development laboratories, and computer centers for major corporations. So, this is EPCOT, the heart of Disney World. 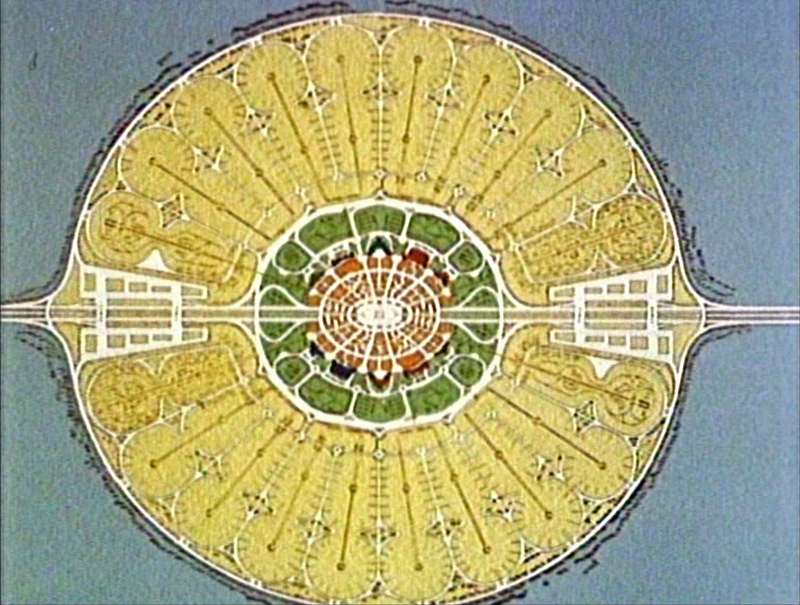 In other parts of the country, a community the size of this prototype could become part of an entire city complex, composed of many such communities, planned and built a few miles apart. In Disney World, about 20,000 people will actually live in EPCOT. Their homes will be built in ways that permit ease of change, so that new products may continuously be demonstrated. Their schools will welcome new ideas, so that everyone who grows up in EPCOT will have skills in pace with today’s world. EPCOT will be a working community, with employment for all, and everyone who lives here will have a responsibility to help keep this community an exciting, living blueprint of the future. And now, here again, is Walt Disney. That’s the starting point for our Experimental Prototype Community of Tomorrow. 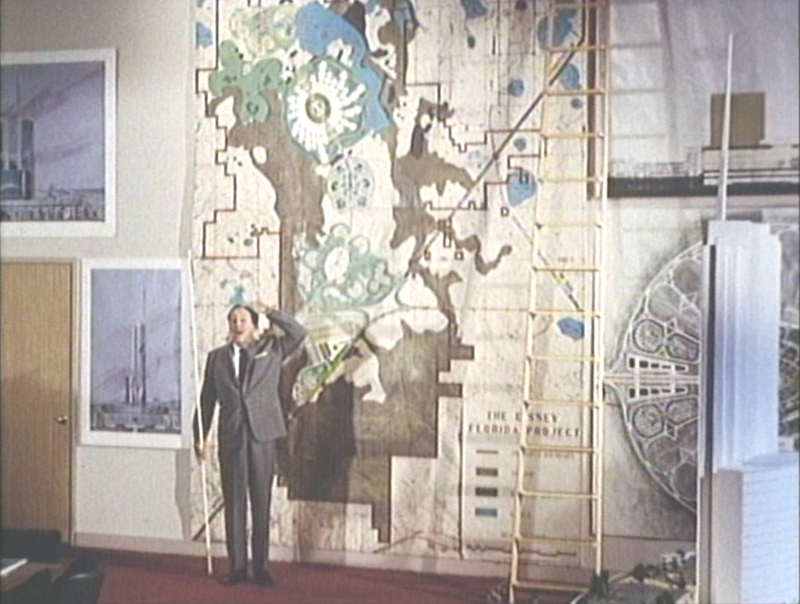 And, now, where do we go from these preliminary plans and sketches? 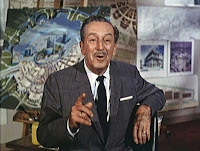 Well, a project like this is so vast in scope that no one company alone can make it a reality, but if we can bring together the technical know-how of American industry and the creative imagination of the Disney organization, I’m confident we can create right here in Disney World a showcase to the world of the American free enterprise system. I believe we can build a community that more people will talk about and come to look at than any other area in the world. 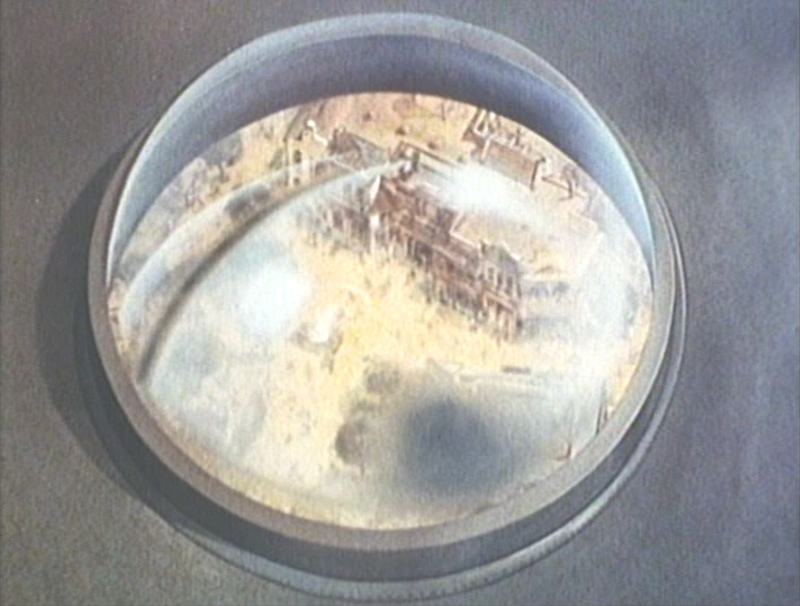 And, with your cooperation I’m sure this Experimental Prototype Community of Tomorrow can influence the future of city living for generations to come. It’s an exciting challenge. A one in a lifetime opportunity for everyone who participates. Speaking for myself and the entire Disney organization, we’re ready to go right now.